Just awesome, as usual. For new Oblivion users: Fully patch your game, have HGEC body replacer and OBSE installed. Don't go crazy installing too many mods all at the same time. Slow down. Apply any patches to mods after considering what was previously installed by YOU. Do not blame the hard working modder if YOU make mistakes. I have never had a problem with this authors mods other than having too much fun and managing an over abundant apparel inventory, lol. Many, many thanks for the beautiful work! 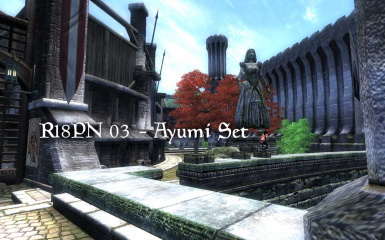 When you enter the Arena District from the Green Emperor Way look to your right along the wall (see the second picture ... it shows where the chest are located). X-Blades is the only Russian animesque-game that Japaneese gamers liked more than russian. The only thing i liked in the game was Ayumis outfit, and here it is . Oh man I love your work. I'll endorse the mod a little while later, tomorrow maybe. But please keep up this amazing work! ok i cant find it. the boxes in the picture by the arena arent there. any ideas? One of the sexiest Game-Babes ever - now playable in the best game ever!!! I like Ayumi very much but her own game is boring as hell! I like this movies. Japan forever! 10. Thank you for this set of great armors and weapons. However, where does the folder "omake pose" go? Under the "Oblivion" folder?